People have believed in werewolves ever since ancient times. From the ancient Greeks to the Vikings, werewolves have appeared in literature and mythologies. The modern legend has it that werewolves are men that can turn into wolves. Normally, a werewolf only takes his wolf form on the night of a full moon. To become a werewolf, you must be bitten or scratched by a werewolf. Werewolves are scary creatures that are usually feared. However, they’re celebrated in this Novomatic online Casino slot game! In Tales of Darkness Full Moon, there’s a famous werewolf who can aid you in getting some seriously big wins. This is one of a few new dark slots from Novomatic. Also, in the series is: Tales of Darkness Break of Dawn and Tales of Darkness Lunar Eclipse. This tale of darkness involves werewolves and a full moon! You can tell that this game is being played in the dead of night. Darkness looms on the path behind the reels. The foreboding gates and trees are only lit by moonlight. You definitely wouldn’t want to be walking down this path alone at night. This is an online video slot with 5 reels and 40 paylines. If you aren’t afraid of werewolves, and you love to get big wins and free spins, then this is the game for you. 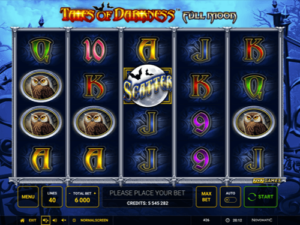 You can play Tales of Darkness Full Moon at an online casino that offers Novomatic games. Go to our casino review section to find your next haunt! Normally, a full moon is the scariest night of the month but you’ll want to see the full moon in this online slot. The light from the moon lights up the symbol, especially when you spin the reels and they stop showing winning combinations! A winning combination of symbols will pay you a cash win. You can gamble your cash wins or you can collect your cash wins. On the paytable, every win for every symbol is shown clearly. The win amounts will change with your bet, whether you lower or increase your bet per spin. Every symbol has a minimum payout which will be awarded for 3 of a kind, as well as a 4 of a kind payout and a 5 of a kind payout. 5 of a kind payouts are the maximum wins you can get in this game. The 40 paylines pay from left to right and only award payouts for symbols on successive reels (beginning from reel 1). 9, 10 and Jack symbols give a maximum payout of 2x your bet. Queen, King and Ace symbols give a maximum payout of 4x your bet. The black cat and the owl give maximum payouts of 6x your bet. The wolf symbol can award a maximum payout of 12.5x your bet. Finally, the werewolf (in handsome human form) pays out a maximum win of 25x your bet. The Wild symbol can land anywhere on the middle three reels of Tales of Darkness Full Moon. This symbol is a typical Wild symbol and it substitutes for all symbols but not for the full moon Scatter. They say that all sorts of strange things happen on the night of a full moon, including werewolves taking their wolf form! Don’t be afraid of the full moon in this game. In this online slot, the full moon is the best night of all! The full moon symbol is the Scatter symbol in Tales of Darkness Full Moon. 3 Scatters anywhere in sight awards 10 Free Games. 4 Scatters award 15 Free Games and 5 Scatters award 20 Free Games. All Free Games go together with the Full Moon Bonus! This bonus is actually quite different from the bonus in Tales of Darkness Break of Dawn. The Free Spins are played on identical reels, except with way more Wild symbols! These Extra Wild symbols will stand out and they’re mega stacked. When you spin the reels in Tales of Darkness Full Moon, you could actually stop them with several reels completely covered in Wild symbols! The game will tell you how many Wild symbols are being added onto the reels and more and more will keep being added, the more spins to use.